The discovery of stone tools found in a Florida river show that humans settled the southeastern United States far earlier than previously believed—perhaps by as much as 1,500 years, according to a team of scientists that includes a University of Michigan paleontologist. Michael Waters of Texas A&M University and Jessi Halligan of Florida State University led a research team that also included U-M's Daniel Fisher and scientists from the University of Minnesota, University of Texas, University of Arizona, Stafford Research Laboratories in Colorado, Aucilla Research Institute in Florida, and Exeter and Cambridge universities in the United Kingdom. A report on the team's findings is scheduled for online publication May 13 in Science Advances. 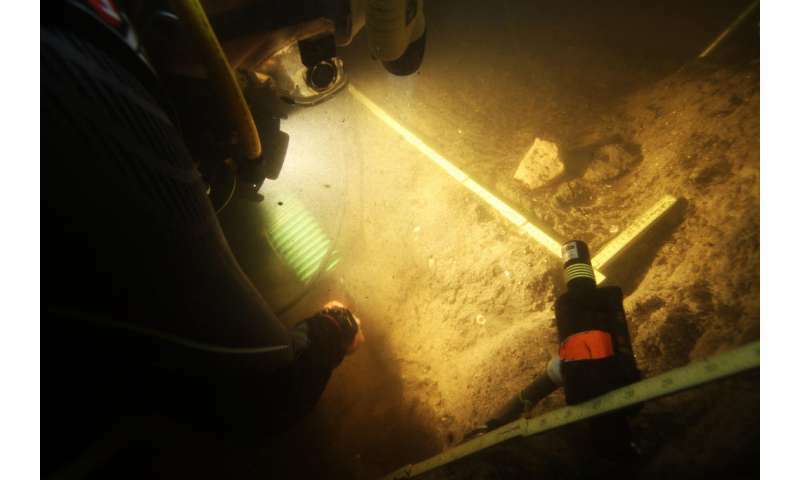 The researchers excavated the Page-Ladson site near Tallahassee, an archaeological site that is 26 feet underwater in a sinkhole on the Aucilla River. It was named Page-Ladson after Buddy Page, a former Navy Seal diver who first brought the site to the attention of archaeologists, and the Ladson family, owners of the property. The site was first investigated from 1987 to 1997 by James Dunbar and David Webb. But their original findings, which included eight stone tools and a mastodon tusk with apparent cut marks, were dismissed. 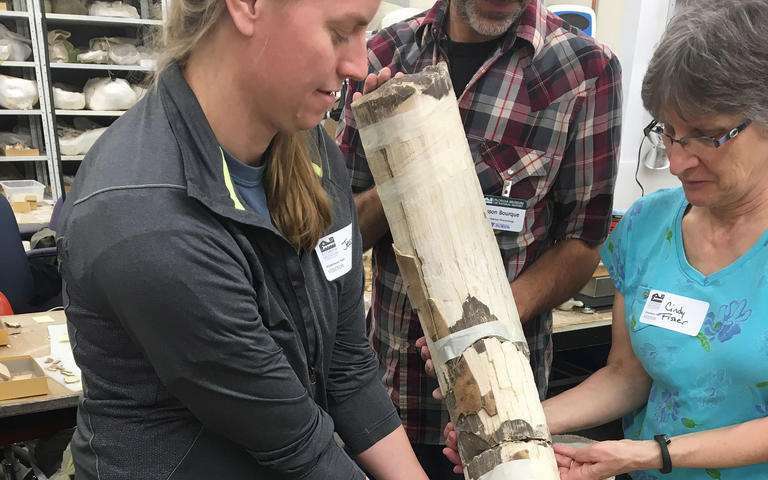 U-M's Fisher reassembled and re-examined the tusk and concluded that the original interpretation—that the deep, parallel grooves in the surface of the tusk are cut marks made by humans using stone tools to remove the tusk from the skull—is correct. "These grooves are clearly the result of human activity and, together with new radiocarbon dates, they indicate that humans were processing a mastodon carcass in what is now the southeastern United States much earlier than was generally accepted," said Fisher, director of the U-M Museum of Paleontology and a professor in the Department of Earth and Environmental Sciences. "In addition, our work provides strong evidence that early human hunters did not hunt mastodons to extinction as quickly as supporters of the so-called 'Blitzkrieg' hypothesis have argued," Fisher said. "Instead, the evidence from this site shows that humans and megafauna coexisted for at least 2,000 years." 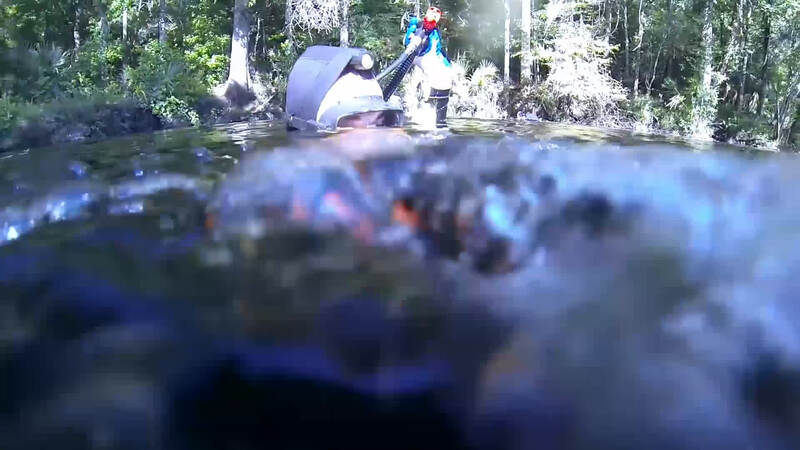 Working in near-zero-visibility waters in the murky Aucilla River from 2012 to 2014, the team led by Waters and Halligan excavated stone tools and the bones of extinct animals. The stone tools included a biface, a knife used for cutting and butchering animal meat. Seventy-one new radiocarbon dates from the Page-Ladson site leave no doubt that the artifacts date to about 14,550 years ago. It's believed that Clovis hunters—once widely considered the first inhabitants of the Americas—settled in various sites about 13,000 years ago. "The new discoveries at Page-Ladson show that people were living in the Gulf Coast area much earlier than believed," said Waters, director of Texas A&M's Center for the Study of the First Americans. "The stone tools and faunal remains at the site show that at 14,550 years ago, people knew how to find game, fresh water and material for making tools. These people were well-adapted to this environment. The site is a slam-dunk pre-Clovis site with unequivocal artifacts, clear stratigraphy and thorough dating." Fisher's re-examination of the mastodon tusk revealed more than a dozen deep, parallel linear grooves on the end of the tusk that attached to the skull. The grooves are perpendicular to the long axis of the tusk. Most are 6 to 8 centimeters long and 1.5 millimeters deep or less. "Each tusk this size would have had more than 15 pounds of tender, nutritious tissue in its pulp cavity, and that would certainly have been of value," he said. Another possible reason to extract a tusk is that ancient humans who lived in this same area are known to have used ivory to make weapons, Fisher said. Tusk roots, like all mammalian tooth roots, are suspended within their socket by a system of fibers called the periodontal ligament. "It now appears that people were targeting disruption of this tissue when they cut into the side wall of the tusk socket, leaving the set of transverse grooves," Fisher said. Fisher has excavated mammoths and mastodons in North America and Siberia and has personal experience with the practicalities of tusk removal. He once removed a tusk from a juvenile woolly mammoth preserved in Siberian permafrost. That carcass was in a condition similar to a freshly killed animal, he said. Because he needed to avoid unnecessary damage to the specimen, and because he had to improvise methods and tools to get the job done, it took him about eight hours. "Compared to ancient hunters, I was a novice," Fisher said. "But I quickly learned that the most important thing was disrupting the ligament fibers holding the tusk in place." The Clovis hunters originated south of the large ice sheets that covered Canada at that time and are the direct descendants of the earliest people who arrived in the New World around 15,000 years ago. "This is a big deal," Florida State's Halligan said of the Page-Ladson discoveries. "There were people here. So how did they live? This has opened up a whole new line of inquiry for us as scientists as we try to understand the settlement of the Americas." Texas A&M's Waters said the Page-Ladson site has changed dramatically since it was first occupied 14,550 years ago. Millennia of deposition associated with rising water tables tied to sea level rise left the site buried under 15 feet of sediment and submerged. "Page-Ladson significantly adds to our growing knowledge that people were exploring and settling the Americas between 14,000 and 15,000 years ago," Page-Ladson said. "Archaeological evidence from other sites dating to this time period shows us that people were also adapted to living in Texas, Washington, Oregon, Pennsylvania, Wisconsin and South America. Clearly, people were all over the Americas earlier than we thought." Additionally, the evidence from Page-Ladson and the other sites shows that people coexisted with and hunted large mammals, such as the mammoth and mastodon, before they became extinct, he said. 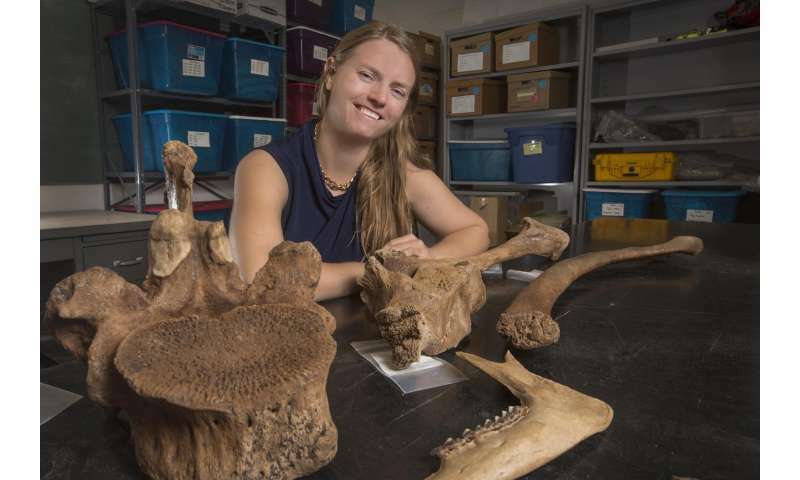 Work by Texas A&M graduate student Angelina Perrotti on the dung fungus Sporormiella shows that extinction of the megafauna occurred around 12,600 years ago at the Page-Ladson site, a date that is synchronous with other regions in North America, Waters said. Now we are ready to toss Clovis First and countenence older human occupation dates, thanks to the steady erosion of that dogma based on work at other sites. However in the late 90's, this site was 'dismissed' altho the data is apparently not greatly different between then and now. When will we stop suppressing data based on currently fashionable dogmas and 'let the data speak'? Plaudits to Fisher et al for their work. Should we not also now credit Dunbar and Webb? @Arrowstone: Presumably the data did speak, but the initial voice was frail and the dating uncertain. "The site was first investigated from 1983 to 1997 (Fig. 1, B and C), and the original investigators reported finding eight stone artifacts associated with butchered mastodon remains from a deposit radiocarbon dated to ~14,400 cal yr B.P. (10). These findings were challenged, and the site was relegated to an ambiguous status (11, 12). We returned to Page-Ladson in 2012–2014 to evaluate the archaeological and geological context ..."
Wasn't there a skeleton found on Indian land that was suspected of greatly predating the migration of the Indians to the Americas that the tribe tried to keep out of the hands of scientists just because it might actually be older? Probably not, but if you find a citation, please share. Sounds like the dogma got run over by a karma. I never could figure out the whole "Clovis first" thing anyway. The point at which the theory becomes more important than the data is the point at which the proponents of the theory aren't doing science any more. There was plenty of data, even in the '90s, to show that there were sites older than the Clovis culture. I found it ironic that the Indians were claiming that the skeletons were their ancestors without any evidence. They were blocking scientists from determining what if any genetic relationship those skeletons had with the tribe. I think that was his point Torgjorn. I also agree with him - the evidence has been accumulating to support pre-Clovis civilization. Your cites reference a suspected age of 9,600 years. That is not "greatly predating the migration of the Indians to the Americas." I don't find their position ironic. People make many claims without evidence. That does not mean the claims are, ipso facto, invalid. The Shoshone-Bannock didn't want me digging up 150,000 year old b. Latifrons bones. It's part of their spirituality. We can contort ourselves in a game of twister, trying to cast doubt upon the thinking of those with whom we disagree; trying to discern their *true* motivations. After all, there is no way anyone would disagree with us if they knew what we know, and if they were as enlightened as us. It's like the idea that men who like guns or fast cars: they are trying to make up for some physical short-comings. An arm chair psychology that itself is antithetical to science. Most Indians I know aren't as concerned about our myths about them as we are. Indeed, why would they seek to defend a myth about them which we created? They are much more grounded in reality than our mistaken perceptions of them. Agreed, if he had said that. He said "altho the data is apparently not greatly different between then and now". But it isn't, the data is now "evaluated" so that it is no longer "challenged" and "ambiguous", which it wasn't before. And, unless I am mistaken, the earlier data has become robust due to being complemented with much more of the same. Sorry, but where do I go to read about the stars and ratings and all that? I just clicked on someone's stars to find out about them. Things changed but I learned nothing. Sorry for the digression and clicking on stars.. It's pretty simple. You can give someone one through five stars, by clicking on the number you want to give; the rightmost star is five, the leftmost is one. Five stars is great, one is lousy. Thanks. I now understand the stars. How do I interpret the numbers, like, for example, 4.4/5 (3). ? And what does that sliding filter do for me? I should be smarter than this, but I've never seen anything like this on other discussion boards. It means 4.4 out of five, with three votes. You can use the slider to eliminate any posts that have lower than the number you select on the slider, but like I said, with all the trolls it's essentially useless because they give anybody who makes any sense a bunch of ones with their sockpuppets. I've never seen it elsewhere either, and it would work better if they'd clean the stables every so often and kick all the trolls off, but they won't because they want the traffic. In addition, our work provides strong evidence that early human hunters did not hunt mastodons to extinction as quickly as supporters of the so-called 'Blitzkrieg' hypothesis have argued," Fisher said. "Instead, the evidence from this site shows that humans and megafauna coexisted for at least 2,000 years." Hopefully, this is the beginning of the end to that human/mega-fauna extinction travesty. Of course, with the conspiracy fringe like antisciencegorilla it's all or none. If he would bother to do a diligent review of the literature as it stands, the best consensus- SHITE! Run for the hills!!! Consensus!!!! !- is that the answer to the question is different in Europe and NA. Evidence is pretty good that's what happened in Europe. Already stressed by the floral change-over at the end of the last glaciation, humans delivered the coup de grace. In NA the disappearance is problematic in that it may have happened as fast as a century or two, and that seems a bridge too far for those in NA at the time. That's where the research showing that nitrogen fixing forage plants became extinct in NA after the last glaciation, and, well, ask any heavy livestock farmer how long they'd last without a nitrogen source like clover or alfalfa. They were reintroduced by Europeans. Oh, I do apologize. I'm speaking about data. antisciencegorilla has a political agenda. "Humans cannot affect nature". Hey, SFBs. Make that statement falsifiable or take your religion elsewhere. What kind of moron can't notice that THE MOST DEFINING trait of humanity is altering the natural environment? "Your cites reference a suspected age of 9,600 years. That is not "greatly predating the migration of the Indians to the Americas." I don't find their position ironic. People make many claims without evidence. That does not mean the claims are, ipso facto, invalid. The Shoshone-Bannock didn't want me digging up 150,000 year old b. Latifrons bones. It's part of their spirituality." First, we won't know what the real age of the skeleton is until testing, correct? Second, no tribe has sat on the same piece of land for over 9,000 years so the likelihood of such remains being of the same tribe is.... remote. Third, if I say that researching Darwinism is interfering with my 'spirituality', can I shut it down? First, you didn't say "know". You said: "Wasn't there a skeleton found on Indian land that was *suspected* of . . . " [Emphasis mine.] Your citations reference suspected dates well after arrival. Second, as far as legal jurisdiction is concerned, "tribe" is the entity that we treat with. It's their land and if they want to stop us from digging the bones of four-legged tribes or any other tribe, it's their call. It doesn't have to be "their" tribe. Third, no you can't. You aren't a Nation with treaty rights. Treaties shall be the supreme law of the land (Article VI). Science reporting on the Clovis without any mention of Ales Hrdlicka or the Clovis Police eliminates any possibility that the reader can learn from those former mistakes. ... unless people use the references and check the back story, which is always a Good Thing To Do. Really, concern trolling? Let us concern troll right back, how is commenting on anthropology helping your EU fantasies? "The Clovis hunters originated south of the large ice sheets that covered Canada at that time and are the direct descendants of the earliest people who arrived in the New World around 15,000 years ago." 15,000 years ago maybe or maybe not - but not a fact, just the current estimate based on "best data". Three! We can certainly hope.